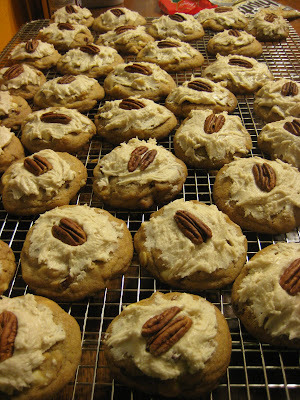 diary of a crazy person: Maple Pecan Cookies - Keeper! 1. In a large mixing bowl, cream the shortening, butter and brown sugar. Add eggs, one at a time, beating well after each addition. Beat in vanilla and maple flavoring. Combine flour and baking soda; gradually add to the creamed mixture. Stir in vanilla chips and pecans. 2. Drop by tablespoonfuls 2 inches apart onto ungreased baking sheets. Bake @ 350 for 9-11 minutes or until golden brown. Cool for 2 minutes before removing to wire racks. 3. In a mixing bowl, cream the butter, icing sugar, maple flavoring and enough milk to achieve desired consistency. 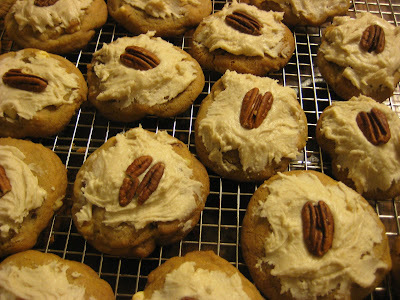 Frost each cookie with 1 teaspoon frosting; top with a pecan half. REVIEW: I loved these! They were so tasty and soft. Most people liked them unless they didn't like pecans. Some said it was too sweet. I think I made them too big and the icing too thick. I would use more than 5 tablespoons of milk for the icing if you need it cause these cookies would only need a thin layer of icing. I made mine too thin! I think they do need the icing cause the cookies themselves are not that sweet. If I made them again I would make then alot smaller and with thinner icing. These are definitely a keeper! I want to make them again right now! Let me know if you try them and how you like them!!! these ones look delish! who are your testers? the beth moore bible study sounds great. good for you for going! who's leading it? Oh yum! I'm going to have to try those sometime.